Bushman’s Nek Berg and Trout Resort - Underberg Accommodation. 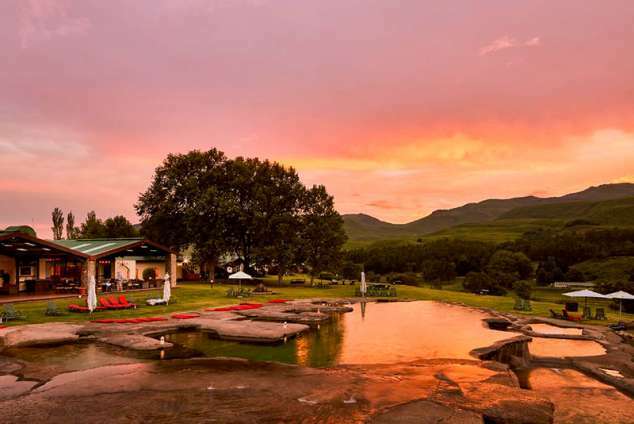 Bushman’s Nek Berg and Trout Resort, situated in the picture-perfect foothills of the Southern Drakensberg, offers a selection of luxury hotel rooms, self-catering apartments and rustic log cabins. With a restaurant serving delectable cuisine, a wellness spa, horse riding, paintball, conference & wedding facilities and loads of entertainment for the whole family, Bushman's Nek is bound to captivate your imagination and quench your thirst for outdoor adventure. Bushman's Nek has self-catering apartments, rustic self-catering log-cabins, and hotel rooms, ranging from comfortable 2-sleeper suites, to spacious 3-bedroom, 8-sleeper apartments. The self-catering 4-sleeper studio apartments face the mountains, dam or gardens and have double sleeper couches, a double bed, full bathroom with shower, fridge, freezer, oven and stove. The honeymoon suite sleeps two and has a spa bath, shower and King size bed. Most of the 1-bedroom log cabins have mountain or partial mountain views and feature a bathroom with bath, basin and toilet, double bed in the main bedroom and a fully-equipped kitchen with fridge, freezer, oven and stove. The 2-bedroom log cabins have mountain or partial mountain views and feature two bathrooms each with a basin, shower and toilet and a fully-equipped kitchen with fridge, freezer, oven and stove. The main bedroom has a double bed, while the second has two singles. The lounge has a double sleeper couch that can sleep 2 children under the age of 12. The hotel rooms, situated close to the central complex and dining area, have a double bed, TV with selected channels, a full bathroom with shower, and stunning views of the gardens. The hotel rooms are not self-catering but do have tea and coffee making facilities. With mountain and garden views, the 2-bedroom chalets are fully self-catering with 2 full bathrooms, fridge, freezer, oven and stove. The main bedroom has a double bed, while the second has two singles. The lounge has a double sleeper couch that can sleep 2 children under the age of 12. This cosy 3 bedroom, 6-sleeper log cabin at Bushman’s Nek features 3 en-suite bathrooms and an open plan lounge, dining room and fully equipped kitchen. Two bedrooms have double beds, while the third bedroom has two single beds. There are two 3-bedroom, 8-sleeper chalets at Bushman’s Nek each with 3 bedrooms, 2 full bathrooms, fridge, freezer, oven and stove. The main bedroom has a double bed, while the second and third bedrooms have two singles each. The lounge has a double sleeper couch that can sleep 2 children under the age of 12. Tantalize your taste buds at The Bushpot, open for breakfast, lunch and dinner and serving an array of delectable treats. Try one of the great weekly specials and Sunday buffet or just pop in for a quick bite, The Bushpot has something to suit your tastes. La Vita provides a haven for guests to enjoy a wide range of wellness massages, anti-ageing treatments, manicures and pedicures. Available to men, women and children, plus a great gift collection. The facility includes a Jacuzzi, and sauna. Bushman’s Nek is ideal for conferences, spa getaways and large or small private functions, with many opportunities for brainstorming sessions, relaxation or teambuilding, making use of our world-class wellness centre, restaurant and entertainment facilities. Bushman’s Nek is the ideal destination for a team-building exercise par excellence with many interesting activities to choose from. Delegates can try their hand at archery, paintball, horse-riding and organized activities during your event, and even relax with a spa treatment afterwards. Celebrate your special day against the backdrop of the Southern Drakensberg, while our dedicated and experienced team service your every need, tailored to your budget. We can arrange everything for you including bespoke menus, décor and even a DJ. Our spacious honeymoon suite ensures a luxurious start to your new life together featuring magnificent views over the mountains and pool. A king-size bed, Jacuzzi, mini kitchen, in-room dining and romantic turndown combine to make your honeymoon night as special as it deserves to be. The pool deck is the ultimate venue for intimate outdoor ceremonies with views of the rock-hewn pool and stunning southern Drakensberg beyond. The pool deck can also be set up banquet style for a unique al fresco reception in the open air. The Underberg area is a favourite among fly fishermen, with the perfect climate for large trout to thrive, we have a trout dam onsite, with equipment for hire, or you can bring your own. Try out this relaxing and rewarding pastime while staying with us. Make your way to one of our two 25-metre alleys for this unique activity featuring adjustable compound bows, suitable for novice as well as accomplished archers. Pack your own or order some treats-to-go from the Bushpot Restaurant and head for the tranquil hills and gentle streams for an unforgettable outing. Spend some time looking over gorgeous farmland views at the Pig and Pony coffee shop where you can snack on a quick bite while sipping on teas, coffees and hot chocolate. Take a trip to New England Farm next door for horse rides into the mountains or kiddies pony rides. Our horses and ponies are friendly and well-behaved, suitable for all levels of rider. New England farm is a delight for children with potbellied pigs, bunnies, lambs, calves, shire horses and Shetland ponies. The quaint ‘Pig and Pony’ coffee shop onsite serves drinks and snacks for you to enjoy while the children do their thing. Get your adrenaline going gainst a scenic mountain backdrop at New England Farm's Paintball arena. This is the perfect activity for those with an itchy trigger finger, and the trained instructors will provide you with all the necessary equipment. Pucketty Farm Stall is an epicurean delight with a host of pies, quiches, pates, puddings, farm cheeses, jams, marmalades, pickles and chutneys to choose from, as well as an animal farm and playground to keep the youngsters busy while you fill your basket. Sani Pass is the only route over the escarpment and into the mountain Kingdom of Lesotho. Originally a track for pack animals carrying goods through to Eastern Lesotho, today it is a spectacular 4x4 track twisting and snaking its way through the rocky cliffs. The Underberg Studio is situated in the picturesque farming village of Himeville at the foot of the Southern Drakensberg. Here you will find the work of several leading South African fine art photographers and ceramists displayed in the gallery. Giant’s Castle Game Reserve, known for its testing hiking trails and San rock art, lies in the Central Berg Region of the uKhahlamba-Drakensberg Park and is home to many interesting creatures including the eland, and the lammergeyer, or bearded vulture. The quaint Underberg Golf Course offers a 9-hole challenge against the rolling hills of the Southern Drakensberg. After your round relax and get to know the locals the clubhouse where you can enjoy a leisurely meal or drinks at the bar. At New England Farm you can venture out among the fields and mountains astride a range of well-behaved, fully trained trail horses accompanied by an experienced guide. Pony rides are also available for young children throughout the day. The resort has basic medical supplies and trained First Aiders. Underberg has a pharmacy, clinic and hospital - 45 minutes drive away. Major hospitals are in Pietermaritzburg, 2 and a half hours away. Bushman's Nek is 250km from Durban (about 3.5 hours' drive) and 600km from Johannesburg (about 7 hours' drive). There is a dirt road from Underberg to Bushman’s Nek, so care should be taken, particularly when driving at night. Get onto the N3 heading towards Pietermaritzburg. North of Pietermaritzburg, take the R617 Underberg / Southern Drakensberg turnoff (Exit 99), travel through Bulwer and Underberg. 21km past Underberg take the second Bushman's Nek turnoff. Travel 17km on a dirt road before turning left into Bushman's Nek. Travel a further 5km before arriving at the resort. 2347 page views since 21 Jun, 2018. Last updated on 08 Aug, 2018.